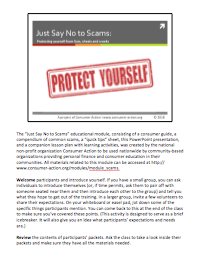 This downloadable PowerPoint presentation is designed to be used in conjunction with the “Just Say No to Scams'” lesson plan. The slides provide a visual component to the training that helps to engage learners and improve retention. This publication is part of the Scams training module.